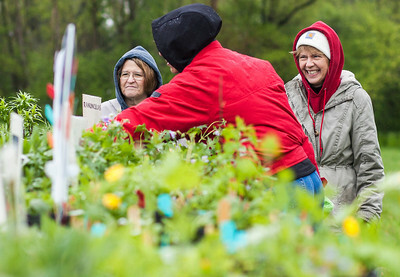 Kyle Grillot - kgrillot@shawmedia.com Laurie Devaki, (from left) Geri Whetham, and Wendy Manser, all of Crystal Lake, look through plants for sale during the 14th annual perennial plant sale at St. Paul's United Church of Christ Friday, May 16, 2014 in Crystal Lake. Ground cover, hosta, trillium, annuals flats, hanging baskets, herbs, vegetable plants and a variety of local perennials are offered at the sale that last until Saturday at 4 p.m.
Kyle Grillot - kgrillot@shawmedia.com Chuck Huddle of Crystal Lake places asian lilies out for sale during the 14th annual perennial plant sale at St. Paul's United Church of Christ Friday, May 16, 2014 in Crystal Lake. Ground cover, hosta, trillium, annuals flats, hanging baskets, herbs, vegetable plants and a variety of local perennials are offered at the sale that last until Saturday at 4 p.m.
Chuck Huddle of Crystal Lake places asian lilies out for sale during the 14th annual perennial plant sale at St. Paul's United Church of Christ Friday, May 16, 2014 in Crystal Lake. 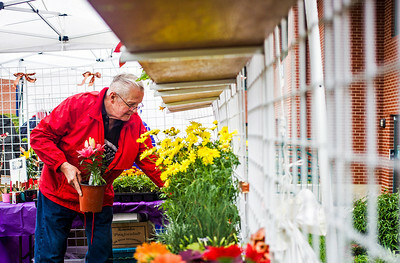 Ground cover, hosta, trillium, annuals flats, hanging baskets, herbs, vegetable plants and a variety of local perennials are offered at the sale that last until Saturday at 4 p.m.